B&B Ireland have been successfully welcoming visitors from around the world for over 47 years. 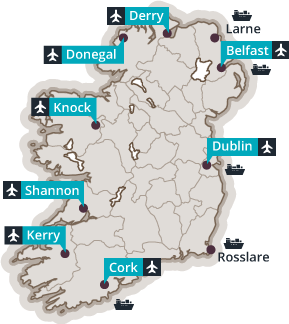 Our selection of over 800 independently-owned, quality assured Bed and Breakfast homes offers you the perfect way to see and capture the true spirit of Ireland. Unforgettable holidays start in a Bed and Breakfast in Ireland! Make your dream trip a reality with an Irish Homestay experience. Your B&B hosts are waiting to welcome you. Go on a journey of discovery along 2,500km of the most captivating coastal route, Ireland’s Wild Atlantic Way. Experience the wealth of heritage Ireland has to offer through the 'Ireland's Ancient East' experience. Spanning 193km, this stunning part of Northern Ireland provides a wealth of incredible attractions and scenery. Dublin provides the perfect backdrop for exploring the magic of Ireland's capital. When location scouts for Star Wars: The Last Jedi were seeking places that were out of this world, Ireland was a firm favourite!